Living in the desert often comes with the unfortunate arrival of scorpions in our homes. For top rated scorpion control in Phoenix, you can trust the professionals at Varsity Termite & Pest Control. With five star reviews on both Google and Yelp, you can trust our scorpion removal experts to rid your home of these unsightly creatures and give you peace of mind knowing that you won’t come across any surprises. For the best Phoenix scorpion removal, contact the exterminators at Varsity Termite & Pest Control! Looking for expert Phoenix scorpion control? Look no further than the professionals at Varsity Termite and Pest Control. Our highly trained technicians are able to get the job done right. And our customer service is second to none. Our Scorpion Barrier system has been stopping scorpions from entering Arizona homes for years and can protect your home too! Call us today for a Free Scorpion inspection at 602-757-8252 or visit us online at VarsityTermiteAndPestControl.com, today! To the majority of people, scorpions appear to be pretty creepy creatures. Plenty of people have an innate fear of scorpions, one reason scorpion extermination in Phoenix is so popular. In reality, the only scorpion which produces a lethal sting is the Arizona bark scorpion, but scorpion pest control in Phoenix is contacted for all types of scorpions found in the area. While Phoenix scorpion control is definitely necessary for getting rid of the bark scorpion, it’s still a good idea to keep other scorpion species out of your home as well. Their sting, while not lethal, can be painful, sometimes requiring medical attention. They have fluorescent materials on their outer shell. Because of this, scorpions glow under a black light. Scorpion extermination in Phoenix often involves the use of black lights in dark areas in order to spot and eliminate hard to see scorpions. Scorpions are often found inside of shoes. In fact, many scorpion stings occur on the soles of the feet, when unsuspecting people try and put on a shoe which a scorpion has crawled into. Scorpion pest control in Phoenix will search dark, enclosed spaces throughout your home in order to find these creatures. Scorpions are nocturnal. Since scorpions tend to be active at night, when people tend to be sleeping, they may not be readily apparent to homeowners. When Phoenix scorpion controlis called, they’ll utilize a black light to find the dark spaces scorpions may be hiding. Female scorpions are quite aggressive. After mating, they may eat the male scorpion, and if they get hungry enough they may even eat their own young! Even so, scorpions are rarely aggressive towards humans. Most scorpion extermination in Phoenix deals with the more dangerous Arizona bark scorpion. Although scorpions have four pairs of eyes, they have terrible eyesight. It is because of this poor eyesight a scorpion may end up stinging a human, mistaking it for a predator. Scorpion pest control in Phoenix can help ensure that you don’t have to deal with scorpions in your home. While the majority of scorpions are not dangerous, very old and very young people may be in danger when being bit by any scorpion. It’s because of this that you should contact a qualified Phoenix scorpion control company to help you deal with any scorpion species you might encounter. At Varsity Termite and Pest Control, we specialize in keeping scorpions out of your home in the first place. Contact us at 602-757-8252 to learn more about our Scorpion Barrier system. For trained scorpion exterminators in Phoenix who can eliminate these creatures from your home, trust Varsity Termite & Pest Control! Keep the scorpions out of your home with the top rated scorpion pest control experts at Varsity Termite & Pest Control! Say goodbye to those unwanted pests! When you find scorpions in your home, the scorpion exterminators at Varsity Termite & Pest Control can make sure they are removed from your home for good! Schedule Your Free Phoenix Scorpion Inspection Today! If you find scorpions on your home and you need professional scorpion exterminators to drive them from the premises, schedule your Phoenix scorpion inspection today with Varsity Termite & Pest Control. With five star reviews on Google and Yelp, you can trust our exterminators to make sure your home is sealed and secure from existing and any future scorpion infestations. For more information, contact us today and schedule your Phoenix scorpion inspection! When it comes to scorpion control in Phoenix, your best bet is preventing scorpions from entering your home in the first place. One of the best ways to do this is through use of the Scorpion Barrier system, a process created by Varsity Termite and Pest Control which has been keeping many Arizona homes scorpion-free for years. The Scorpion Barrier system provides the best Phoenix scorpion controltherefore Arizona residents, and Varsity is your number one company for AZ scorpion control. Around electrical outlets and points of plumbing. Inside small cracks. Because scorpions are so fond of small, dark places, dusting inside of cracks is a must-do for any Phoenix scorpion control system. Around electrical outlets inside and out. Around plumbing inside and out. Around screening and vents. Most companies offering scorpion control in Phoenix will seal these areas and other problem areas around your home to prevent scorpions from entering. It’s important to contact a Phoenix scorpion control company to deal with these pests. Although most species don’t present a life threatening danger (the Arizona bark scorpion being a notable exception), better safe than sorry is the name of the game. AZ scorpion control is necessary because it may be difficult to know which species you’re dealing with, and some people, such as the very young and the very old may be susceptible to infection from scorpion bites. You should not attempt to remove or exterminate scorpions by yourself unless you know what you are dealing with and know beyond all doubt that you are not dealing with bark scorpions. These scorpions may live in colonies of up to 30, and they carry the most potent venom of any of the scorpion species found in the Southwestern United States. Bites from a bark scorpion are extremely painful. If bitten by a bark scorpion, seek medical attention. Contact a company specializing in scorpion control in Phoenix right away if you think you have even seen a bark scorpion. 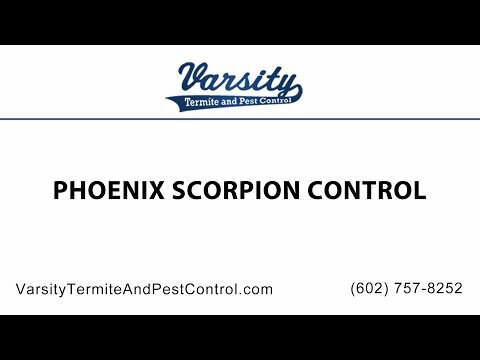 At Varsity Termite and Pest Control, we are the experts when it comes to Phoenix scorpion control. For a free scorpion inspection and evaluation, contact us today at 602-757-8252.